Why nonlinear programming problem (NLO) called “nonlinear”? What does “nonlinearity” actually mean? Is it “not linear” or something different? I. Does the nonlinearity mean nonlinear objective function? II. For one variable $\bf x$, does the nonlinearity mean that the function is not a linear map? Definition here. III. or does the NLO mean a problem with nonlinear constraints? IV. or does the NLO mean a problem with nonlinear constraints and nonlinear objective function? V. or instead of linear mapping is a NLO problem with an objective function with certain smoothness? VI. and what kind of requirements a NLO problem require: what kind of convexity assumptions for domain and codomain? Does the function itself need to be convex or concave? More detailed question related to convex optimisation here. Any of I, III or IV would make a problem non-linear. The answers to VI will probably covered during your course and different convexity conditions may lead to different algorithms. We can see that at play here: non-linearity can creep in at literally any stage of the process. 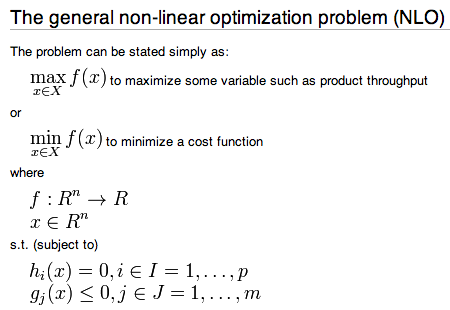 The only thing "non-linear" means is that at least one of the functions $f$, $h_i$, and $g_j$ are non-linear. Not the answer you're looking for? Browse other questions tagged definition nonlinear-optimization or ask your own question. What is a convex optimisation problem? Objective function convex, domain convex or codomain convex? What needs to be linear for the problem to be considered linear? What is the correct change of variables to yield convexity in this nonlinear optimization problem? Does it make sense to optimise a problem with linear objective and nonlinear constraints with Sequential Quadratic Programming? Related to Sequential Quadratic programming and about optimization in general? When is LICQ useful in KKT conditions?